Everyone looks for the best garden tools that help get the job done. Preferences aside, we can all agree that they need to have these three qualities. I have a favorite wheelbarrow that has traveled with me across the country. It has four wheels, so it’s stable and easy to manage. That baby is a workhorse hauling manure, soil, and mulch to the far corners of my garden. I know that I could have purchased a new one once I arrived at our new home, but this barrow is broken in just right! For me, it’s an essential garden tool that I won’t be without. What do you consider to be the best garden tools? Perhaps they are the ones that help you make quick work of the weeding, digging, and pruning tasks in the garden. Maybe they are the ones that fit your yard size. Some may consider a tractor the perfect tool, while urban gardens won’t have the need for it or the room! The best garden tool is made of good quality and is able to withstand more than one year of work, while still being left out in the hot sun. They do not have to be professional gardening tools. The best garden tool is economical. We asked the Rootsy Community to share their favorite garden tools! ::Kris says – “My favorite is the Hula Hoe. It makes it easy to knock down young weeds as they sprout in between garden plants. I’ve had mine for years.” For more expensive tools, consider the idea of tool sharing in this post by Attainable Sustainable. The Hula Hoe is also called a push-pull hoe or an action hoe. It works by scraping the top inch or two of the soil and removing young weeds before they can get a foothold in the garden. ::Allison says – “My narrow shovel. It’s easy for me to use and gives me just the right size hole for transplants, and drags a lovely row in the garden.” This kind of narrow shovel is often called a D-Handle Transplanting Spade and is ideal for digging small, deep holes, digging up bulbs and other precision plantings in the garden. 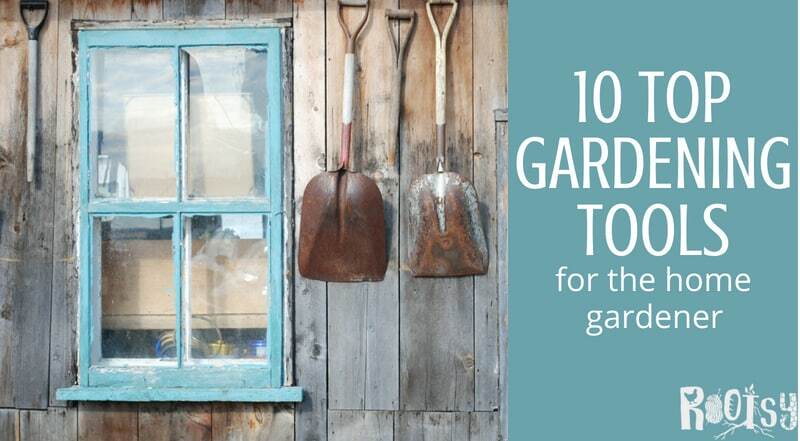 Every small garden will benefit from this tool. :: Connie says – “the Hori Hori is my most frequently used hand tool and I love using it.” The Hori Hori garden tool has two working sides, a pre-sharpened flat side, and a serrated edge side for chopping and slicing through tough soil. They say that it is the one tool that can do anything in the garden – weed, dig, prune, transplant, measure, cut, and harvest. ::Char suggests a trowel with a serrated edge that she uses regularly in her garden. This tool is different from the Hori Hori in that it not only has serrated and sharpened edges but a cutting tip and hook for chopping off sturdy weeds and cutting open bags. ::Chris says – My favorite tool is my own hands. I use them for weeding, for planting, for creating holes for seeds, and for drawing lines in the dirt. I space my seedings using my thumbs and hands for measurements. I could use a stick for these jobs or a fancy hand turned dibbler. But more often than not I just use my hands. They are close and I don’t need to find them when I need them. Be sure to check out this post about tool sharpening from Joybilee Farm. ::Tessa suggests Ratcheting Pruners as a handy garden tool. “I didn’t use these until I worked as a florist but, seriously, where were they all my life?! They’re so much easier on hands and wrists.” The ratchet in the pruner has a clever extra mechanism to make light work of tough cuts. As you squeeze ratcheting pruning shears, they latch so you can release and squeeze again, performing the cut in easy steps rather than one go. As you cut through a branch, the ratcheting mechanism clicks and moves to the next setting, providing ever-increasing pressure as you cut. ::Shelle says – “I like my old wheelbarrow with 4 wheels. I think I will cry why it finally dies!” These barrows are sturdier than a regular wheelbarrow and can handle heavy loads. They put less stress on your shoulders, arms, legs, and back – which is helpful after a full day in the garden. ::Amanda says – “My dumping wagon! I use it for EVERYTHING in the garden and around the yard!” Dumping carts are a terrific tool to have if you are constantly moving large piles or dire, rock, or sand. The four-wheel design makes them sturdy on uneven terrain and saves you from having to shovel out the contents when you reach your destination. ::Angi says – “I love my Sloggers….not really a gardening tool but then again, they kind of are.” We totally agree with Angi! After a day of gardening, slogger boots make cleanup quick and their cushy insoles mean you won’t have achy feet, even after 20,000 steps. 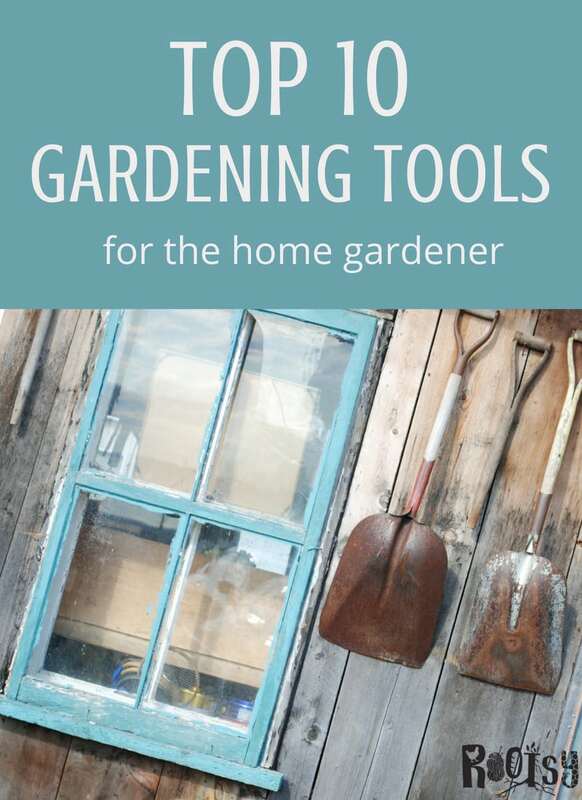 Do you struggle with losing tools in the garden? This handy hard canvas tote from Bucket Boss has inside and outside pockets for storing individual tools and can double as a harvest tote too. If you have a large assortment of tools that you keep with you, a traditional Bucket Boss might help you keep track of them. Ratcheting pruners!! I didn’t use these until I worked as a florist but, seriously, where were they all my life?! They’re so much easier on hands and wrists. My dumping wagon! I use it for EVERYTHING in the garden and around the yard! My narrow shovel. It’s easy for me to use and gives me just the right size hole for transplants, and drags a lovely row in the garden. My favorite is the hula hoe. It makes it easy to knock down young weeds as they sprout in between garden plants. I’ve had mine for years.